Latino $55 billion-a-year Quince & ceremony market! My Quince magazine is the quinceañera magazine of the future. It integrates and appreciates the Latino culture, flair, and ethnicity of the Latina girl. With our bilingual format, My Quince magazine is faced with the opportunity to aspire Latina girls to plan and organize a cultural quinceañera. We whole-heartedly embrace the beauty of our diversity and experience a richness of color and life. My Quince magazine hopes to help usher in an era in which Latina girls can delight in American and Latino heritage and background. 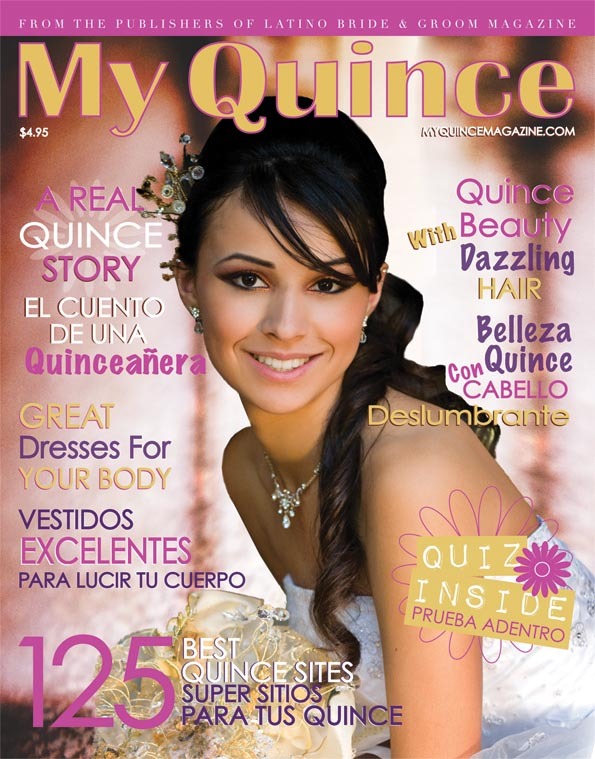 My Quince magazine is the premier bilingual multi-cultural, multi-ethnic, and multi-racial quinceañera magazine bringing you the latest in the quince industry and beyond. We recognize that a quinceañera is more than a festive social gathering; it is an important celebration for every Latina girl that signals the advent of an exciting yet challenging voyage. In the pages of our publication we provide informative editorials that seek to motivate thinking outside of the box and to prepare the parents and the quince girl – not just for the quinceañera day itself, but also for the voyage. • One insertion reaches over 1.3 million readers. • Our primary readers are girls between the age of 12-16 with a thirst for sound advice and guidance. • All advertisers are automatically placed in our Resource Guide in magazine and in our Vendor Listing online. • Advertisers can promote their special quinceañera events with dates, phone numbers, and website in our My Quince News featured on our website and sent to subscribers. • Latino consumers make up $55 Billion of the bridal & quinceañera market. • An average quinceañera in the U.S. costs $18,490. • My Quince’s reader average quinceañera costs $25,840. We at My Quince magazine represent a fusion of Latino and American cultures and we respect each other’s individual talents, perspectives, and creativity. My Quince magazine will embody this profound throughout each issue. By bringing the Latina girls of the United States and creating a beautiful and inspiring quinceañera magazine, we strive to be of service to girls and parents that seek to celebrate their quinceañera. So, enjoy this beautiful magazine! Obtain a My Quince Button!